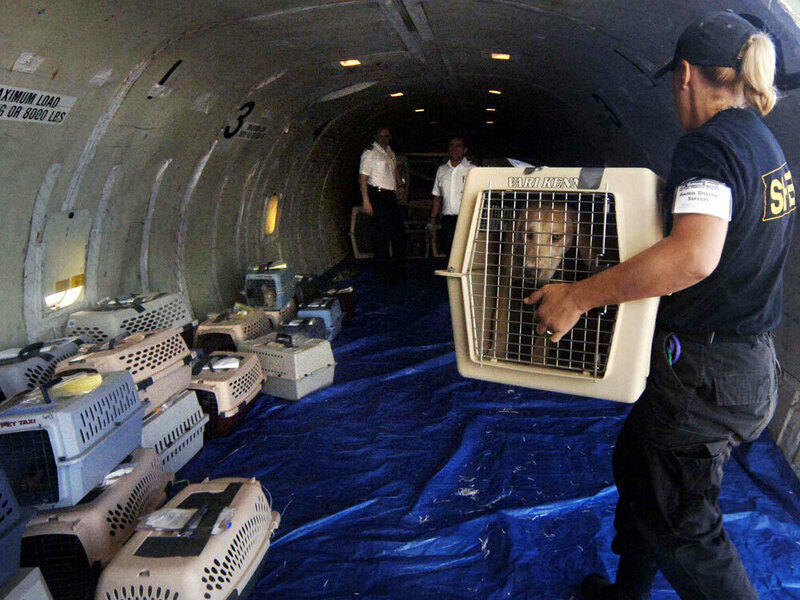 Humane Society workers transport animals rescued following Hurricane Katrina. It's Animal Week on Fresh Air; during these last days of summer, we're featuring rebroadcasts of our best conversations about animals and how we live with them. In 2003, when the city of New Orleans was evacuated due to Hurricane Katrina, an estimated 40,000 animals were left behind. In the weeks following the hurricane's touch down, the ASPCA sent in animal relief workers to rescue those that survived. Margaret McLaughlin, the director of veterinary technicians in New York City's Bergh Memorial Animal Hospital, was one of the volunteers. She spent more than two weeks wading through chest-high water to find animals. "We would just motor down the street and just whistle and at any given time you could hear five or six different dogs barking," McLaughlin tells Terry Gross. "And we would ... collect them and put them in carriers. And when our boat was full, we'd just bring them back to our staging area, go back out again [and] get another boat full." McLaughlin says that some people who had remained in the city during the storm refused to leave their water-logged houses without their pets: "They would not leave their pets behind," she says. "We go in and get their pets and then they can be evacuated. So even though we're helping the animals, and our mission is to help the animals, we're still helping the people." This interview was originally broadcast Sept. 14, 2005.